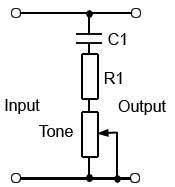 Understand typical circuits used for tone control in audio amplifiers. • Passive Bass - Treble Control. • Active Bass - Treble Control. • IC control of common amplifer functions. Tone Control, shown in its most basic form in Fig. 4.2.1 provides a simple means of regulating the amount of higher frequencies present in the output signal fed to the loudspeakers. a simple method of achieving this is to place a variable CR network between the voltage amplifier and the power amplifier stages, The value of C1 is chosen to pass the higher audio frequencies, this has the effect of progressively reducing the higher frequencies as the variable resistor slider is adjusted towards the bottom end of the tone control, The minimum level of attenuation of the higher (treble) frequencies is limited by R1, which prevents C1 being connected directly to ground. As the circuit only reduces the high frequency content of the signal it could be called a simple Treble Cut control. The use of these simple circuits is normally restricted to guitar applications or inexpensive radios. In hi-fi amplifiers, tone control refers to the boosting or reduction of particular audio frequencies. This may be done to suit the preferences of the listener, not everyone perceives sound in exactly the same way, for example the frequency response of the human ear changes with age. The room or hall in which the sound is reproduced will also affect the nature of the sound. many techniques are used to alter the sound, and in particular the frequency response of the amplifiers producing the sound. These range from simple RC filters, through passive and active frequency control networks to complex digital signal processing. The circuit discussed here is an example of the Baxandall tone control circuit, illustrated in Fig. 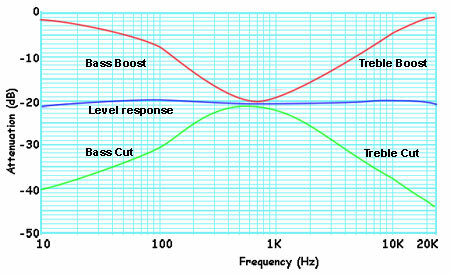 4.2.2, which is an analogue circuit providing independent control of bass and treble frequencies; both bass and treble can be boosted or cut and with both controls at their mid positions, provides a relatively flat frequency response, as illustrated by the blue ‘Level response’ graph line in Fig. 4.2.5. The original design, proposed by P. J. Baxandall in 1952, used a valve (tube) amplifier and feedback as part of the circuit to reduce the considerable attenuation (about −20dB) introduced by the passive network, and to provide true bass and treble boost. There are still many variants of the circuit in use, both as active circuits (with amplification as originally proposed), and as passive networks without an incorporated amplifier. In passive variants of the Baxandall circuit, extra stages of amplification may be used to make up for the approximately −20bB attenuation caused by the circuit. How the Baxandall Circuit Works. With bass and treble controls set to maximum boost (both wipers at the top of resistors VR1 and VR2), and the inactive components greyed out, the circuit will look like Fig. 4.2.3. Both bass and treble potentiometers that may have either linear or logarithmic tracks depending on the circuit design, are much higher values than other components in the circuit, and so with the VR1 and VR2 wipers set to maximum resistance both potentiometers can be considered to be open circuit. Nor does C4 contribute to the operation of the circuit because of the high resistance of VR2, and C1 is effectively shorted out by the wiper of VR1 being at the top end of its resistance track. The full bandwidth of signal frequencies is applied to the input from an amplifier having low output impedance, and the higher frequency components of the signal are fed directly to the output of the tone control circuit via the 2.2nF capacitor C3, which has a reactance of about 3.6KΩ at 20kHz but over 3.6MΩ at 20Hz, so blocks the lower frequencies. The full band of frequencies also appear at the junction of R1 and C2, which together form a low pass filter with a corner frequency of around 70 to 75 Hz and so frequencies appreciably higher than this (the mid and high frequencies) are conducted to ground via R2. Having R2 in series with C2 prevents the attenuation of the mid band frequencies exceeding about -20dB. The lower frequencies are fed to the output via R3. Because R3 has quite a large value (to effectively isolate the effects of the two variable controls from each other, the input impedance (Zin) of the circuit following the tone control must be very high to avoid excessive signal loss due to the potential divider effect of R3 and the Zin of the following stage. With the bass and treble controls both set to maximum cut (Fig. 4.2.4), the full bandwidth signal passes through R1 but with the slider of VR1 at the bottom end of its resistance track, C1/R2 now form a high pass filter having a corner frequency of around 7 to 7.5kHz so only frequencies appreciably higher than this are allowed to pass un-attenuated. The mid and higher frequencies are therefore fed to R3 and C4, which now form a low pass filter to progressively attenuate frequencies above about 70 Hz, the mid-band frequencies (about 600Hz) are reduced by approximately −20dB, and at 20kHz by as much as −43dB, as can be seen from the response curve in Fig 4.2.5. Notice that although the circuit provides what is called bass boost and treble boost, with the passive version of the Baxandall circuit (with no amplification), all frequencies are in fact reduced. The attenuation of the circuit at mid-band is typically around −20dB and with full ‘boost’ applied at either the low or high end of the bandwidth, attenuation at these frequencies would be around −1 to −3dB. To overcome the substantial losses in the passive version of this circuit, which give a level response (with both controls at mid way setting) but at -20dB below the input voltage, it is common to incorporate an amplifier in the designs. Nowadays an op-amp would be a reasonable choice, with the Baxandall network forming a negative feedback loop to give the required gain figures over the necessary bandwidth. Various designs are possible with different values for resistors R1 to R4 and C1 to C4 in the network, depending to some extent on the output impedance of the previous, and input impedance of the following circuits. With active circuits such as that shown in Fig. 4.2.6 the aim is to have the level response at 0dB so there is no gain and no loss due to the tone control circuit. The maximum amount of boost possible should not be sufficient to overload any stage following the tone control if distortion is to be avoided. The design of such control circuits is usually therefore, an integral part of the overall design of an amplifier system. Fig. 4.2.6 An active tone control using a Baxandall network and op-amp with NFB. In modern amplifiers the tendency is to use integrated circuit controls that may be operated by either digital or analogue circuitry. A simple solution for bass, treble, balance and volume control in analogue stereo amplifiers is offered by such chips as the LM1036 from National Instruments. The block diagram and an application circuit is shown in Fig. 4.2.7. Each of the four controls is adjusted by applying a variable voltage of between 5.4V (which is supplied by pin 17 of the IC), and 0V. Half the voltage applied to the control pins 4, 9, 12 and 14 gives a level frequency response, central balance between left and right channels, and half volume. The LM1036 also has provision for a loudness compensation switch. 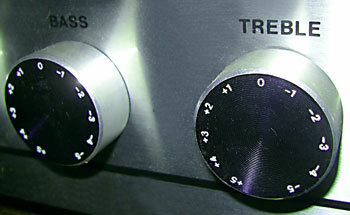 When ‘on’ this changes the action of the controls to boost the bass and treble frequencies when the volume is at a low setting. The purpose of this is to compensate for the fall off in the function of human hearing at high and low frequencies with quiet sounds.